Vegetables have probably never been so rich and satisfying. 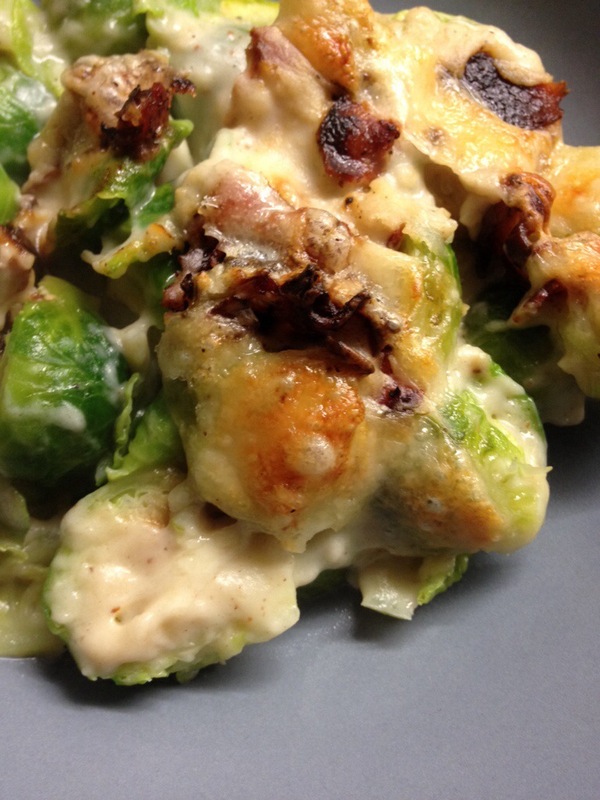 I took the year’s first Brussel’s sprouts, combined them with a nutty brown butter béchamel sauce, crumbled bacon and grated cheese and threw them in the oven. They were so good that we ate half the pan as a main dish and finished off the rest as a side the next day. 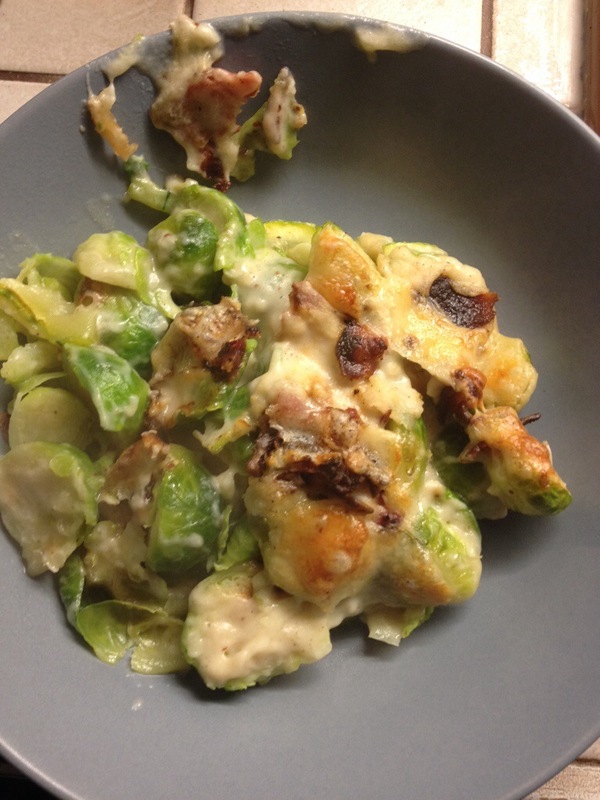 The veggies keep just a tiny bit of their bitterness, which is quickly overpowered by the creamy goodness that is béchamel. You could throw whatever you have lying around in this gratin, I’m pretty sure you can’t go wrong! Bacon! I used about 8 slices, but definitely would have liked more! Preheat your oven to 400°F. First things first, blanch your Brussel’s sprouts. I remove the stem then cut them in two, discarding the first couple of leaves if they’re not so pretty. Put a pot of salted water to boil and drop the sprouts in for about 2-3 minutes, until they’re a vibrant green. Immediately drain and set aside. While the sprouts are cooking, place the sliced zucchini in a colander and add a generous pinch of salt. Set in your sink and leave undisturbed for at least ten minutes, shaking every once in awhile to get rid of any excess liquid that the salt has drawn out. Place in the bottom of a 9×13 pan. Cook the bacon to your liking, then place it on top of a few paper towels to absorb the grease (any grease left in the pan, if it’s not burnt, can be added to the brown butter and used for the béchamel sauce!). 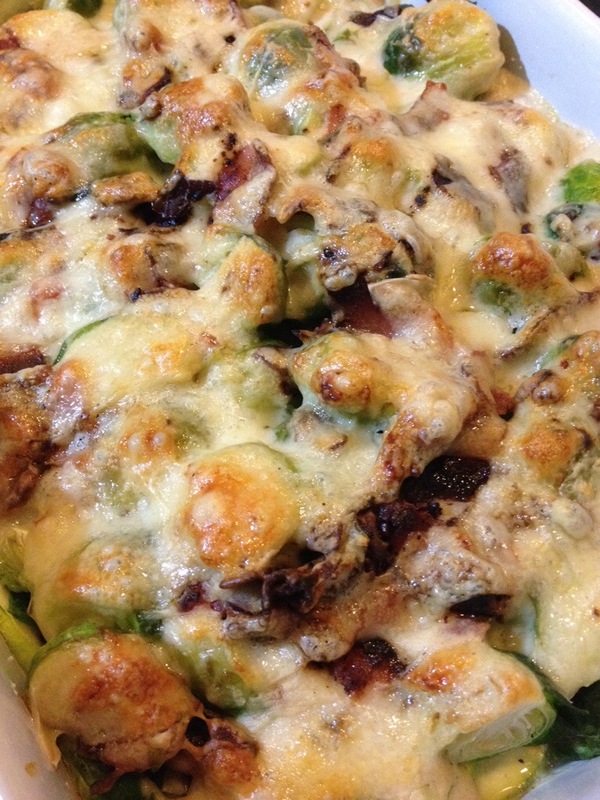 Crumble the bacon once it’s cooled and add to the pan with the zucchini. Once your sprouts are cooked, place them on top of the zucchini. In the same pot, place the butter over medium-high heat. Cook for about 5 minutes, until the butter is browned and fragrant. Dump the flour in all at once and stir vigorously to form a paste. Add the milk and whisk until no lumps remain and sauce has thickened, about five minutes longer. Season with salt, pepper and nutmeg. Pour this sauce over the veggies, then top with the shredded cheese. Place in the oven for about 20 minutes, using the broiler if needed for a lovely, gratinéed cheese crust. Serve immediately! 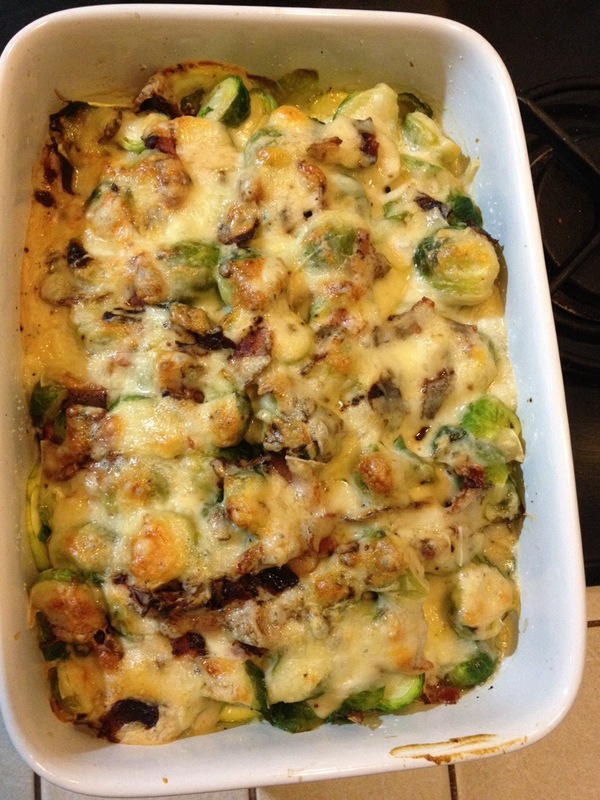 This entry was posted in General and tagged bacon, béchamel, Brown butter, Brussel sprouts, Brussel's sprouts, cheese, comte, gratin, squash, Vegetables, veggies, Zucchini by alamericaine. Bookmark the permalink.